DO YOU FIND YOU ARE DOING "ALL THE THINGS," BUT NOT REACHING YOUR BUSINESS GOALS AS QUICKLY AS YOU WOULD LIKE? DO YOU KNOW YOU NEED TO LEARN TO LEVERAGE DIGITAL PLATFORMS TO SURVIVE IN BUSINESS, BUT YOU DON'T WANT TO SIGN UP FOR YET ANOTHER PRICEY LEAD GEN/SEO/WEB-DEVELOPMENT AGENCY WHO WILL TAKE YOUR MONEY AND NOT DELIVER RESULTS? Do you struggle to find the time to run your business, attend networking events and have enough time for yourself or your family and still have a LIFE? Does the go-getter pace you are on leave you feeling exhausted and on the verge of burnout? Do you suspect there must be a better way to get clients, but you are reluctant to go all in with social media because you have no idea what to say or how to say it -- and you don't want to risk looking like a fool, because after all, your reputation is at stake? If any of that sounds like you, slow down for a minute and take a deep breath, because I can help. My name is Jennifer B. Gardner. I am a trial lawyer and a marketing/copywriting geek, and my passion is helping lawyers and service-based professionals like you become visible online, build an audience and confidently grow their businesses so that they can serve more people and earn more money doing work they love. 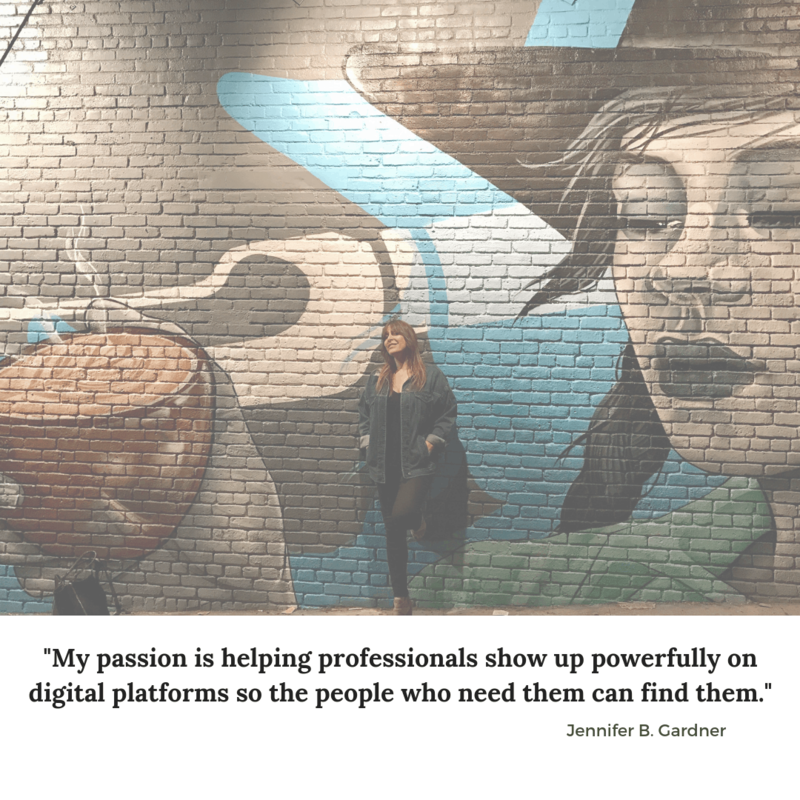 I can teach you how to brand and position yourself, craft your messaging using storytelling, influence and persuasion skills, and leverage digital platforms, so that the right clients who need you can find you. I can help you access inner confidence, find your VOICE, and create powerful and persuasive messages so that you rise above the noise, easily find your tribe and naturally magnetize raving followers-fans-clients who will beg you to do business with them, without spending a ton of money on ads, SEO or paid lead generation or breaking any ethics rules. Marketing doesn’t have to be “hard work.” And, you don’t need a bazillion followers to be able to monetize your presence in social media once you master the inner and outer marketing game. If you are a high-performing professional with dreams to grow your business, have greater impact, and more time and freedom to enjoy your life, I can help you become an industry influencer who quickly and organically attracts dream clients daily. If you know you need to market yourself online but have no idea how to do it, if you know social media is "where it's at," but you're overwhelmed and not sure where to start, I can teach you tools and strategies that will help you reach your goals, fast. I will show you the strategies I use to attract clients online and run two successful businesses, teach you how to automate, delegate and communicate persuasively in digital media, and share resources you can immediately start using to take daily steps towards creating your dream lifestyle and business. With this knowledge you'll never worry again about what to say and how to say it, you'll confidently show up without fear of looking foolish or sounding sales-y, and you'll start generating business organically. Best of all, once you master these skills you'll be miles ahead of your competition. MORE IMPORTANTLY -- THE CLIENTS THAT NEED YOU WILL BE BETTER ABLE TO FIND YOU. There is so much to learn about doing business today, and everything is constantly, rapidly changing. The most important thing is that you start so that you don’t fall hopelessly behind. I am a life-long learner, a searcher, a seeker, a relentlessly curious person. I am never satisfied doing Just One Thing. In addition to being a trial attorney in my own law firm, I have grown a small real estate business, started start-ups, managed the careers of visual artists/filmmakers in Europe and the US, and emerged as an artist. I have traveled the world and learned a lot along the way. I am obsessed with understanding what makes great trial lawyers great and social media influencers influential -- and I have trained with some of the best who are working today on influence and persuasion skills (the written and spoken kind). I'm so excited to be sharing the methods I've learned and use to get outstanding results for my clients and consistently generate as much business as I want as a lawyer. I now serve clients not just by solving their legal problems, but also by teaching tactics and tools they can use to get more clients organically with ease. I do this through workshops, 1:1 consulting, and my Signature Course, the "M4 Method to 10x Your Referrals." If you want to learn to be more magnetic in your posts, your emails, your presentations, your videos, your marketing materials of whatever kind whatsoever, if you are interested in continuing on your path to self-knowledge and success, if you are an action taker and change maker with an inspired vision for yourself and your future, it would be an honor to accompany you on your journey.